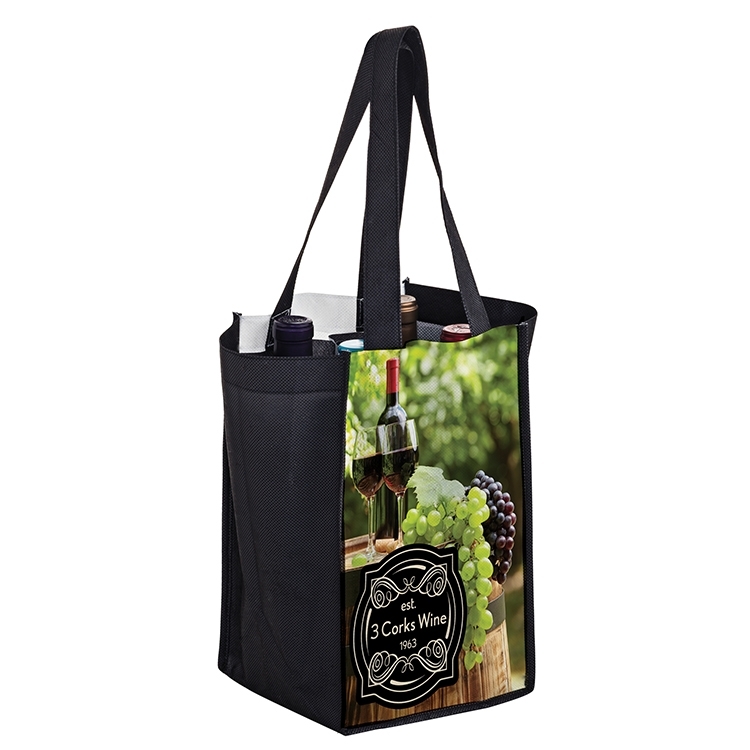 This dye sublimated 4 bottle wine bag offers full panel CMYK full color coverage on the front and back. The front and back panels of this bag are made from 100GSM P.E.T. non woven material and the piping, handle and side gussets are made from 80GSM P.E.T non woven material. Full color seam to seam coverage at an affordable price and quick turnaround timeframe as compared with conventional overseas 4 color process orders. Features sewn-in bottle dividers. 200 per case @ 25 lbs. • Maximum Artwork Imprint Area: 7" wide x 12" high on each side. • Pricing includes an imprint on both sides. • Gusset Imprinting not available on this product.